Grammarly is world’s best known online grammar checker that is free of charge for personal uses. It won our Great User Experience Award for 2018. This robust grammar checker software is powered with the best-in-class grammar checking features, but it’s also more than that. The app goes beyond fixing misspelled words and overlooked grammar mistakes. It even identifies words, albeit spelled correctly, in the wrong context to ensure you won’t overlook any aspect of your copy that can diminish its quality. Designed as a handy add-on, the tool can be easily embedded in your Chrome or Firefox browser, and correct and polish automatically the text you are preparing across different sites and applications. This AI-powered tool ensures your message gets delivered clearly and error-free in a compelling way, which it does greatly especially since it’s built by the world’s leading language authorities. Grammarly is already good as it is but it’s continuously developed each day to improve their online grammar-checking algorithms. The app’s operation technology is both technical and contextual – it helps you correct hundreds of grammar, punctuation, and spelling mistakes. At the same time, it also improves your vocabulary by pinpointing and fixing contextual errors. It will also suggest ideas for you to enhance your writing style, and make your messages more effective and engaging. The software is designed for anyone who writes copy. Students leverage their writing quality on essays, theses, reports, dissertations, and college entrance applications to achieve their academic goals. Leading corporations and universities around the globe are even using the software to check the quality of their written materials. Professionals in a variety of fields, ranging from journalism, law, healthcare, engineering, marketing, and academia, make use of the app to ensure accuracy and credibility. It’s also an essential tool for English language learners, non-native English-speaking professionals, foreign students, job seekers, and everyone who writes posts and statuses on social media. To foster your specific needs in using the tool, Grammarly offers products catered towards your organization. Grammarly Edu is geared towards educational institutions for online writing assistance. It also has Grammarly Business for businesses to incorporate the app into their team’s workflows with enterprise-ready controls and monitoring. Furthermore, it has Grammarly Keyboard for iOS and Android devices that works as your personal editor for proofreading your copy on-the-go. The competitive edge of Grammarly that sets it apart from most grammar and spelling checkers is that it is not just a simple safety net that corrects mistakes and moves out of the way. The overall activity of the tool, once embedded within your browser, focuses on contextual issues and helps improve your knowledge and usage of English language altogether. As you type, Grammarly catches, pinpoints, and fixes even the tiniest mistakes that similar tools might overlook. 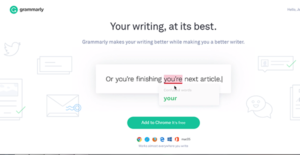 Developed by linguists and passionate experts, Grammarly drills down to details and fixes repetitive words, misspelled words, comma usage, and comma splice. It also replaces weak adjectives with stronger suggestions to help you write more confidently and focus on what is genuinely important – the message you want to convey. Rather than just correcting common mistakes and moving out of the way, Grammarly assists you in a way that will help you understand and remember its modifications and suggestions in order to improve your writing style altogether. To make this happen, Grammarly takes charge of modifier placement and all aspects of the subject-verb agreement and a complete change of context. You can integrate it within any popular Word processor, and use it to perfect your email communication and social media interactions. Designed for educational purposes, Grammarly provides online writing assistance and plagiarism checker to improve the grammar and overall writing style of students and teachers. It has LMS integration for real-time grammar-checking on your web browser and MS Office. This is for K-12, higher education, and libraries and research facilities which gives students direct access to grammar tutorials to help them prepare for college-level writing. Elevating the quality of your organization’s written materials improves the credibility of your business. It’s a single platform with simple onboarding that you can easily drill down in your team’s—with multiple members—workflows to improve collaboration, efficiency, and productivity by reducing time-consuming back-and-forths. An enterprise-grade level system, Grammarly Business gives you admin and user management tools to oversee your processes effectively. If you want to use the app, you can easily do so by copy-pasting your text into your personal Editor. It then shows you the errors to modify, suggested words to replace it with, and explanations of the detected error. It also has a free browser extension for Google Chrome, Safari, Edge, and Firefox that automatically shows you corrections as you type. Additionally, Grammarly may be downloaded for Microsoft Office on Windows. Grammarly is available for anyone for free with no limited timeframes. This already gives you powerful and critical grammar and spelling checks. If you want to unlock more advanced features, especially if you’re writing professionally, you may upgrade to Grammarly Premium for tiered pricing packages based on the duration that you want to use the service. This gives you vocabulary enhancement suggestions, genre-specific writing style checks, plagiarism detector, and advanced checks for sentence structure, grammar, and context. Grammarly has a wealth of educational materials not just on how to use the platform but on improving your grammar as well. The Grammarly Handbook is an online guide for English grammar and style while the vendor’s blog site provides readers with daily tips, insights, and fun commentary about writing and grammar. Reaching Grammarly’s community for discussions and tips with fellow users is accessible via the app’s social media platforms such as Facebook and Twitter, among others. How Much Does Grammarly Cost? Is Going Premium Worth It? If you are interested in Grammarly it could also be sensible to analyze other subcategories of Best Grammar Checker Software listed in our base of SaaS software reviews. Every enterprise has different wants and requires a software that can be personalized for their size, type of workers and clients, and the particular industry they are in. For these reasons, no system can offer perfect functionality off-the-shelf. When you look for a software system, first be sure what you want it for. Read some Grammarly reviews and ask yourself do you want basic functionality or do you want sophisticated tools? Are there any industry-specific functionalities that you are looking for? Find the answers to these questions to assist your search. There are plenty of factors that you need to consider and these include your finances, particular business needs, your company size, integration needs etc. Take your time, check out a few free trials, and finally choose the platform that offers all that you require to enhance your company efficiency and productivity. How Much Does Grammarly Cost? We realize that when you make a decision to buy Grammar Checker Software it’s important not only to see how experts evaluate it in their reviews, but also to find out if the real people and companies that buy it are actually satisfied with the product. That’s why we’ve created our behavior-based Customer Satisfaction Algorithm™ that gathers customer reviews, comments and Grammarly reviews across a wide range of social media sites. The data is then presented in an easy to digest form showing how many people had positive and negative experience with Grammarly. With that information at hand you should be equipped to make an informed buying decision that you won’t regret. What are Grammarly pricing details? What integrations are available for Grammarly? Pros: I like that Grammarly corrects my texts and documents. It is very helpful for me because English is a foreign language. It instantly corrects every mistake and it offers solutions. Also, I can upload documents on their website so I can check my documents for some errors. Cons: What I don’t like is that this tool is limited to English only. I’d like to see more languages included. In addition, the price for advance module is huge. They could improve the mobile app. Pros: I like that I get immediate notifications when something is incorrect, it catches even the smallest mistakes. It sends suggestions on correct words, comma, syntax. I often use it when sending mails and when I have to write documents. It is free to use and it works seamlessly on every platform. Cons: Sometimes when there are complexly-constructed sentences it’s not always accurate. If you need more information about Grammarly or you simply have a question let us know what you need and we’ll forward your request directly to the vendor.